According to Ret. LTG. John R. Wood, Mr. Walker’s leadership of cFocus Software Incorporated and experience in SharePoint, Development, Administration, Web, Help Desk, Information Assurance were important to the theme of the conference and brought value to all attendees. 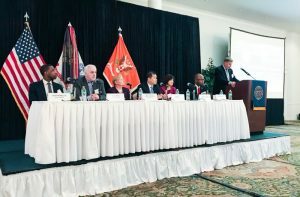 “I am honored that AFCEA selected me to speak on the Barriers to Small Business Opportunities panel!” said Mr. Walker. “I thank John R. Wood of the United States Army for the opportunity to join my fellow panelists from the defense community to discuss some of the challenges on our paths to success,” he said.